The last production I saw at the Guthrie's Dowling Studio was a dance piece about swimming. And now - a dance piece about boxing*. Both shows feature the grace and dance-like movements found in sport. But Trick Boxing, by husband and wife duo Brian Sostek and Megan McClellan, aka Sossy Mechanics, is about more than just boxing. It's a delightful love story told through theater, dance, and puppets. The storyteller guiding us through this little tale (set in the 1930s or 40s) is a gambler and boxing manager named Buck. He discovers a young immigrant who's fast on his feet and decides to turn him into a boxer and use him in a scheme. While training for his first match, Dancing Danny David wanders into a dancehall and meets Bella, the sister of a boxer previously used by Buck. She decides to help Danny get out from under Buck's thumb. The two actor/dancers play about a dozen different characters in the story, with nothing more than a change of accent and body stance to distinguish them. Brian plays Buck, Danny, Bella's brother, a scary evil gambler, the bookie, and several other characters. He often is on stage alone, having conversations with himself, the movement and words of one character flowing seamlessly into the other. In perhaps the most amusing scenes of the play, the boxing matches are represented by puppets in a tiny ring, with Brian doing the play-by-play. And then there's the dancing. Whether it's Bella training her brother, or a demonstration of boxing moves, or Danny and Bella at the dancehall, it's truly a delight to see. I've seen Brian and Megan dance once before, and I've seen Brian in several things as an actor, but I've never before witnessed the full extent of their talent. It's a true pleasure watching artists tell stories using their own unique gifts, and I love the Guthrie for supporting artists and helping them do what they do, while making it easily accessible to theater-goes. You should take advantage of that while you can and go see the show, playing now through September 2. 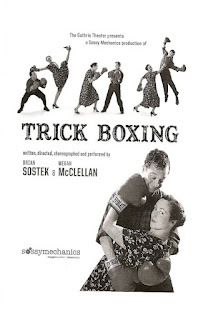 While Swimming with My Mother made me want to go swimming, Trick Boxing makes me want to take swing dance lessons! *I received one complementary ticket to Trick Boxing as part of the Guthrie's "Blogger Night."